Over the first six months of 2016, the gold price rose by almost 20%. Several factors are favorable for the gold price and prominent investors expressed their renewed interest in gold. What price can we expect for 2017 and beyond? While the gold price measured in U.S. dollars fell by about 12% in 2015, the first half of 2016 saw a strong rise of the price per ounce by about 20% – to above 1.260 by mid of June. The price of gold also appreciated in other currencies, e.g., by about 15% when measured in Euros. George Soros the (in)famous investor, invested recently in gold and stocks of gold mining companies and sold shares in other companies. Soros mentioned concerns about the global economy and sees different risks – for the European Union, England, China and others. Let’s take a look at the drivers of the gold price – supply and demand – before we turn to important trends or risks which could impact the drivers. We will also look at analyst predictions and draw conclusions for private investors. These factors will determine demand for gold also in 2017. The actual demand from each area can either be positive, i.e., support the price of gold, or negative, when more gold is sold than purchased. In the latter case, when the total holdings in one category decrease the resulting supply becomes available to other demand sectors. Gold recycling describes the process of recycling gold from technology components or jewelry and supplying it to the new uses. In addition, the total available amount of gold can be increased by mining gold. This basically adds supply by turning so-called ‘below-ground stocks of gold’ into above-ground stocks of gold. How did the supply and demand drivers develop over 2015 and in 2016? 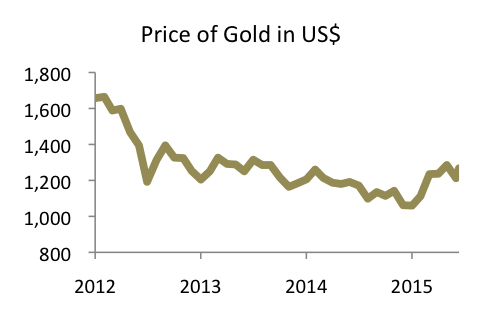 According to the World Gold Council, overall demand for gold in 2015 was about the same as in 2014. Jewelry took with 57% of total demand the largest share. Annual demand from jewelry was down by about 3%. Reasons for this decline were lower demand from Turkey, China, Russia and the Middle East – due to political challenges and economic weaknesses, also because of falling oil prices. Investment demand was the second largest gold demand factor in 2015 and accounted for about 21% of total demand. Total investment demand increased by 8% compared to 2014. While the demand for physical gold investments in the form of bars and coins was more or less flat, demand from gold-backed securities improved significantly: The outflows from those instruments decreased by nearly 30% – but net demand for gold exchange traded funds and similar products was still negative. Reasons for the improved overall investment demand were the political turbulences, e.g., in terms of Russia and Turkey, economic threats like the UK potentially exiting the Eurozone or a revival of the crisis in Greece and an economic slowdown in markets such as the US and China. The third largest driver of demand were the central banks: They accounted for 14% of total demand for gold. In 2015, demand from central banks increased only slightly by about 1%. But the total demand from central banks was very close to its all time high in 2013. It is obvious that central banks continue to diversify their assets. Significant buyers of gold were the central banks of Russia and China, which are diversifying away from the U.S. dollar. Finally, demand for technological applications like electronics and dentistry was down by 4.5% in 2015. 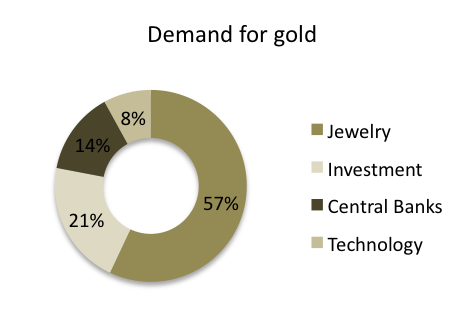 But technology demand only accounts for about 8% of total demand for gold. The decline of demand for gold for technological purposes is in line with the long term trend. Turning to supply from mines and recycling, total supply decreased by 3.5% in 2015. Mine production grew at the lowest annual rate since 2008, while gold recycling hit the lowest volume since 2007, shrinking by about 7%. The reason for this weakness was the low price of gold in 2015. Looking at the first months of 2016, the demand for gold was very dynamic. In the first quarter of 2016 demand rose strongly by 21%. The Investment demand rose by over 200%! The driver for this rise was an exploding investment demand for gold-backed securities. Just within one quarter all the outflows of 2014 and 2015 were recouped with inflows of 364 tonnes of gold into exchange traded funds and similar instruments. The much higher demand for gold investments surpassed the declining demands from the other areas by far. In the first quarter, jewelry demand declined by 27%. This development reflects rising economic uncertainties and rising gold prices as well as special factors such as an increase of duties and taxes on gold and the jewellers strike in India. The key question for private investors for 2017 and beyond will be what global trends will prevail and how those trends will impact the price of gold. According to the International Monetary Fund, the real global economic growth was for the last four years below the 20 year average of 3.8%. In 2015, real growth was down to just about 3%. The slowing growth likely had a negative impact on overall commodity prices. The price for oil fell below U.S. dollar 30 for the first time in more than 10 years. In April 2016, the IMF reduced its projections for economic growth further. Slower economic growth dampens demand for jewelry, which accounts for nearly 60% of total gold demand. On the other hand, higher economic uncertainties can lead to a flight into gold investments. Lower economic growth is often reflected in low interest rates. This reduces the opportunity costs of holding gold, since gold pays no interest. In addition, in a climate of slow growth, investments like stocks or real estate can decrease in value. This can make the ‘safe haven’ gold more popular and attractive to investors. The IMF forecasts a small increase in global economic growth for 2017, but acknowledges various risks. In 2015, more than 60% of global economic growth was attributable to China and other emerging markets in Asia. Beginning of 2016, Chinese exports and imports are further slowing. It still remains to be seen, whether the Chinese economy can be further smoothly rebalanced towards a higher reliance on domestic consumption and services. Interest rates are at historically low levels. The envisioned rate increases in the United States and other countries could impede economic growth. Due to weak growth, the further rise of interest rates in the U.S. was already delayed beginning of 2016. An increase in interest rates could further stall economic growth. Global total debt levels have risen significantly over the past 15 years. The total debt level stands now at about 300% of gross domestic product, an increase by more than 120 trillion U.S. dollars compared to the year 2000. It still remains to be seen how debt levels could be reduced in the future. Rising interest rates could put a major burden on debtors. Economic worries in the Eurozone, namely a potential exit of Greece or the United Kingdom, could pose significant risks not only to the economies in Europe but to the global economy. According to many experts, debt levels for Greece are not sustainable. But currently there is no solution in sight. A further risk to the global economy is the tech bubble seen by many commentators. After record years, funding for new ventures is already starting to dry up. The number of startups valued above $ 1 billion – so called ‘unicorns’ – has reached about 200. Just the company Uber accounted for more than $ 60 billion in valuation, which is estimated to be 100 times Uber’s sales. Some venture capitalists are already talking about a winter coming. Unlike 2000, nowadays startups investments are mostly held privately. But also mutual funds and institutional investors like insurers are invested. A burst of a bubble could bring negative impacts in other areas and sectors – in some way similar to the situation in 2000. The overall impact of a materializing risk to the global economy on the gold price is difficult to predict: While a downturn would impede demand for jewelry and technology, investment demand could increase. The first quarter of 2016 showed a strong rise of the gold price amid a record-low oil price and many economic concerns. Actually, during the financial crisis gold prices continued to soar – in contrast to the prices of many other investments. End of 2015 various forecasts were published but at that time the gold price in U.S. dollars had not yet picked up. The average forecasted gold price for 2016 by the members of the London Bullion Market Association (LBMA), issued in the beginning of 2016, was U.S. dollars 1,103 per ounce. The investment bank Morgan Stanley estimated in April a price of $ 1,250 per ounce of gold by the last quarter of 2016 or the start of 2017. RBC Capital Markets predicts a price of $1,300 per ounce in 2017 and beyond. But historical experiences with analyst forecasts show that those forecasts are more often lagging emerging trends than correctly anticipating future developments. The hard truth is: Taking potential trends and their impact on gold into consideration, there is no reliable way to forecast the price of gold in general or specifically for the year 2017. But basically, this truth holds true for all asset classes not just gold. Private investors, who are not pure speculators, should hold a mixed portfolio of assets about a longer term. Due to its unique characteristics gold can be used to diversify investment portfolios. As outlined, in times of financial stress, the price of gold often demonstrates very different behaviors than other asset classes like stocks or bonds. Many investors still view gold as some kind of safe haven asset. Physical gold is no financial product and therefore does not have some of the associated risks. For instance, physical gold unlike stocks or bonds will likely never use its value completely. But that does not imply, that gold is riskless – it holds other risks. A prudent investor should hold a balanced portfolio, a portfolio in which gold can play a role, but the respective allocation should be limited. As with all investments, key considerations for investing in gold should be the costs, i.e., fees, and safety. When considering physical gold investment, vaulted gold – professionally stored physical gold – often beats other forms of physical gold or even gold-backed securities in terms of costs. Let’s see, what 2017 brings in terms of the gold price.